Bronx, NY – If you are looking for orthodontic treatment in the Bronx area, especially if you are an adult, you may be hoping for a more discreet treatment option. Today, there are more discreet options than ever before, and Invisalign is leading the pack. But, what all is involved in choosing Invisalign and the best Invisalign provider in Bronx? Let’s take a look at some of the most important things to know about getting clear aligners by tackling some commonly asked questions. Is Invisalign more expensive than other treatment options? Invisalign is usually slightly more expensive than traditional metal braces. However, the treatment is becoming more and more popular, and the costs are continuing to lower, so the cost can many times be very comparable to metal braces. If you have a dental plan that covers orthodontic treatment, clear aligners should be covered as part of that plan. This can significantly help defray some of the cost of Invisalign or any other treatment option you choose. What are the main advantages that make patients love clear aligners so much? The first primary advantage is that the aligners are clear, making it harder for others to tell you are undergoing orthodontic treatment. They are made of smooth plastic, so they are comfortable and cause less irritation. There are no brackets and wires to rub against the inside of your mouth. They are also removable, so you don’t need to make any changes to your diet. There have to be some disadvantages, too, though – what are they? People love clear aligners because the aligners are removable. It’s nice to think about treatment without having to forego some of your favorite treats. But, because they are removable, it can also be easy to forget to wear them as you should. To ensure effectiveness, the aligners must be worn a minimum of 22 hours a day. That means they should only be taken out to eat, drink, brush and floss. How long will I have to wear Invisalign? There is no set answer to that question, unfortunately. We cannot tell you exactly how long your treatment will take because it depends on several factors. First is how well your mouth responds to treatment. Some people find their teeth adjusting quickly and efficiently, while others may find their mouths take a bit longer. However, the most important element with clear aligner is patient compliance. The patient is often the main factor in determining how long treatment will take. If you follow all of your orthodontist’s recommendations, wear the aligners as required, change them out properly, wear elastics when directed, and also remember to take care of your teeth and gums, you will ensure treatment progresses as quickly as it can. Is it difficult to keep the aligners clean? Each set of aligners is only worn for about two weeks, but it is still important you take the time to properly clean them. If not, food debris and plaque can build up on them, leading to tooth decay and bad breath. Depending on the type of food you eat frequently, the aligners may also turn color ie. Curry, turmeric, coke, red wine, coffee. Your orthodontist can provide you with a retainer or denture cleaner to soak the aligners in. This will remove any buildup and ensure they are fresh and clean. You can also use a soft-bristled toothbrush to gently clean the aligners. Do I only need to brush and floss twice a day, like I did before Invisalign? While you are in clear aligner treatment, your toothbrush will become your best friend. It is important to clean your teeth properly after meals and snacks to prevent trapping any debris between your teeth and the aligners. If you aren’t able to brush properly before you have to put your aligners back in, be sure you rinse your mouth well with water at the very least. How painful is Invisalign treatment? Unfortunately, no orthodontic treatment is without a little discomfort. We are guiding your teeth to new locations, after all. You may notice some minor discomfort on your first few days after you switch out every new aligner, but they are typically comfortable to wear without much scratching of the lips, tongue and cheeks. Will I talk funny when I wear the aligners? You may notice your speech a bit altered when you first get your aligners, and you may have a bit of a lisp. This is due to increased saliva production as your mouth gets used to the aligners being there. Your tongue will also need to adjust because it needs to make contact with the back of your teeth to make certain sounds. The more you practice speaking with the aligners in, the faster you will be able to return to normal speech. Do the aligners really need to be removed anytime I eat or drink anything? The answer to that is yes! If you chew with the aligners in, you can damage them and alter their fit. They then will be less effective at moving your teeth. Likewise, if you drink anything other than plain water with them in, they can become discolored or damaged. Hot drinks like coffee or tea can warp the plastic of the aligners. I see a lot of orthodontic patients using little rubber bands, but Invisalign doesn’t require those, right? That is not always the case, and it depends on how severe your malocclusion is. When Invisalign was first released, it really was only effective for more minor issues. But the technology has improved greatly, and it can now treat more moderate to severe malocclusions. But sometimes, that requires the use of buttons, attachments and rubber bands. 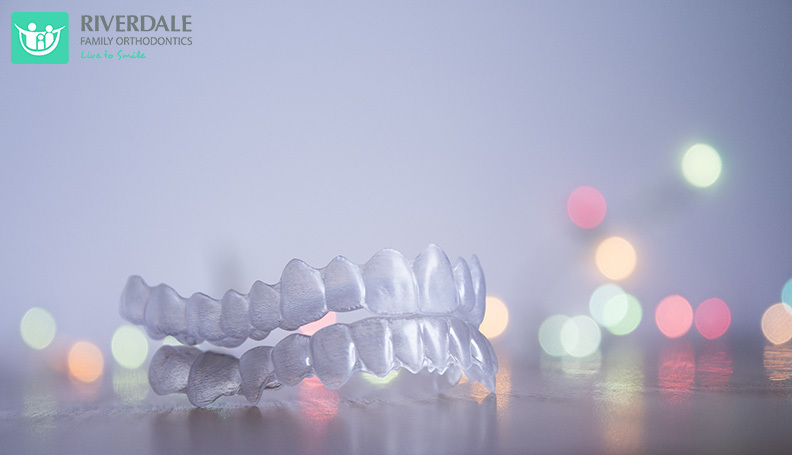 The aligners themselves correct the alignment of the teeth, but sometimes the issue involves correctly lining up the teeth and the bite, as well. Rubber bands can help accomplish that. Is it difficult to take the aligners out? Because the aligners need to be removed when you eat, even if it is just a quick snack, you’ll probably want to practice putting the aligners in and taking them out. They are designed to fit snugly over your teeth, so you may notice it takes a bit of practice to easily and discreetly remove them at first. WIll I still need a retainer after clear aligners? Every orthodontic patient will need to wear a retainer after their treatment. This is especially important in the months immediately following treatment because the tissues in your mouth may try to pull the teeth back to their previous locations. A retainer will do exactly what its name implies – retain the teeth in their new locations. It is important to wear your retainer as your orthodontist recommends to avoid undoing the hard work you put in during treatment. Is there a difference between Invisalign and Invisalign Teen? They are the same as far as treatment goes, but Invisalign Teen can come with a few perks for our younger patients. Because we know it can be easy to forget to wear your aligners 22 hours a day, Invisalign Teen comes with compliance indicators to show you (and your parents and orthodontist!) that you are wearing them properly. We know you have a lot going on, so the indicators will help you stay on track. We also know that because you’re busy and removing the aligners when you eat, it’s very possible that an aligner might get accidentally thrown away or lost. Six replacement aligners are included in the Invisalign Teen fee just for this purpose. Clear aligners are an excellent option for many patients, If you are interested in learning more about the treatment, and if you might be a good candidate for it, call Riverdale Family Orthodontics today at 718-884-7700.